Late last year, Claire and I spent six weeks or so tripping through the American Deep South. It was, initially, all about music, food and whiskey, and while all three of those elements featured heavily, the trip ultimately became an observation of American life - it was our first time to a place we felt we knew intimately, having grown up with the music in particular, but it turned out to be a place about which we knew almost nothing. As such, it became about trying to discover how it all worked, how it all came together, how the seamy underbelly meshed with the glitz and glam, how the dust and grit and grime melded with the shiny and new to create a place that marches to the beat of its own drum. And so I wrote about it as we went. I always do this when we travel, but this was different - over the course of a month and a half, I wrote around 30,000 words, which has come together to form my first book. It's not that long obviously, kind of a non-fiction novella, but it essentially recounts the trip, and my thoughts on a place as alien as it was familiar. I've self-published it, with a killer cover design by Verity Bee, basically so's I have something to look back on in 50 years. 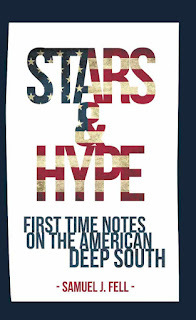 It's rough, raw, essentially un-edited, a savage journey to the heart of the American south (to steal from a famous line). For American and European readers, the title will be available on Amazon. For Australian readers, copies will be available for order from this page, from September 9. The title will also be available in selected stores throughout the Byron Shire. A non-fiction novella, Stars & Hype: First Time Notes On The American Deep South, the first book from Australian journalist Samuel J. Fell, is set for release on FRIDAY SEPTEMBER 9. No doubt a result of writing the soundtrack to Peter Strickland’s 2014 film, The Duke Of Burgundy, the second collaboration between The Horrors’ Faris Badwan and songwriter Rachel Zeffira is a cinematic affair. 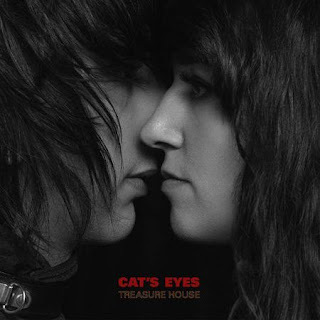 Following on from Cat’s Eye’s eponymous 2011 debut, Treasure House is lush and dark, it ebbs and flows, as expansive as it is intimate and cosy. Equal parts dreamy soundscape and punk aesthetic, imbued with a poppishness that softens the edges, it’s a record which begs repeated listens. It eases you in with the swirling title track and Drag, before catching you off guard with the more urgently delivered Be Careful Where You Park Your Car and Standoff. The latter are where the punk first comes in, and it’s the mark of a carefully considered album that they don’t seem out of place. working particularly well on The Missing Hour, as is the mainly electronic backing, although it does grate in some instances. Overall though, an enjoyable sonic journey. This year has seen the celebratory planets align for roots music festivals, a coincidental grouping of auspicious anniversaries that’s seen a slew of milestones hit across some of Australia’s major events. WOMADelaide, the Woodford Folk Festival and Port Fairy hit their twentieth, thirtieth and fortieth anniversaries respectively, while the big daddy of them all, the National Folk Festival in Canberra, celebrated its half century back in April. Away from the nice round numbers, arguably the most well known of all the country’s events, the Byron Bay Bluesfest, played out for the twenty-seventh time. 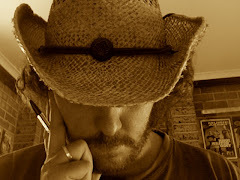 And conversely, one of Australia’s lesser-known roots events, the Gympie Music Muster, this year pulls on its dusty boots for the thirty-fifth time – a long way down the track from its inaugural event, which was essentially a party in a paddock, just outside of the town for which it’s named. The Muster has a special place in punter’s hearts, a mecca for country music away from the glitzier, in-town event that is the Tamworth festival. These days set in the Amamoor Creek State Forest Park, the event first ran out at Thornside, the property of The Webb Brothers, a well-known country trio who’d just won their second Golden Guitar award, and with the help of the local Apex Club, decided to put on a celebration. “We thought we’d have a party,” laughs Berard Webb on the maiden event, which also stood as a celebration of 25 years in country music for the trio, as well as a celebration of 100 years since their grandfather had founded Thornside, in 1882. 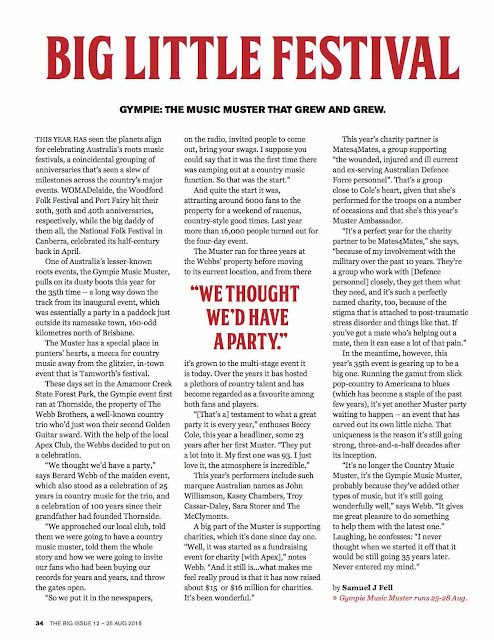 “So we approached our local club, told them we were going to have a country music muster, told them the whole story and how we were going to invite our fans who had been buying our records for years and years, and throw the gates open. 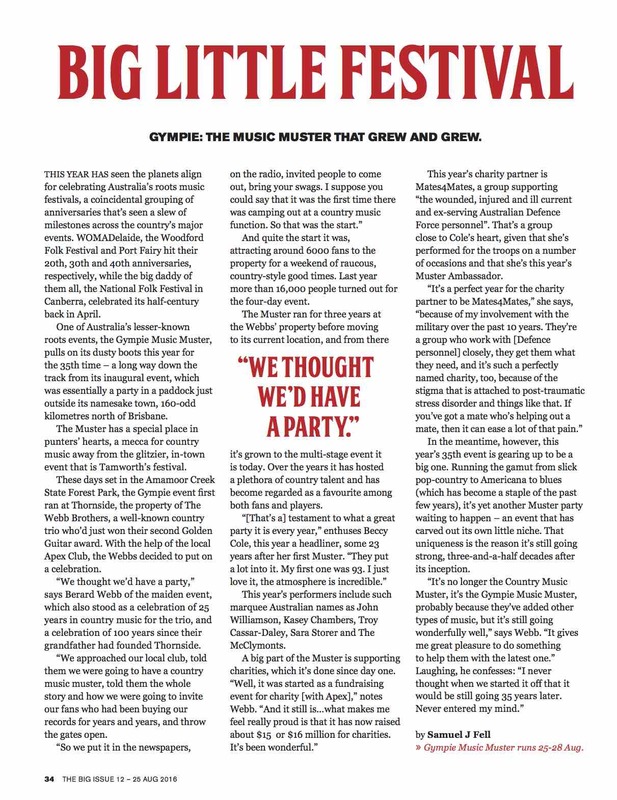 “So we put it in the newspapers, on the radio, invited people to come out, bring your swags, and I suppose you could say that it was the first time there was camping out at a country music function. So that was the start.” And quite the start it was, attracting around 6000 fans to the property for a weekend of raucous country good-times. The Muster ran for three years at the Webb Brother’s property before moving to its current location, and from there has grown to the multi-staged event it is today. Over the years it’s hosted a plethora of country talent, and has become regarded as a favourite, among both fans and players. This year’s charity partner is Mates 4 Mates, a group supporting “the wounded, injured and ill current and ex-serving Australian Defence Force personnel”, a group close to Cole’s heart given she’s performed for the troops on a number of occasions, and is this year’s Muster Ambassador. “Very much so, it’s a perfect year for the charity partner to be Mates 4 Mates, because of my involvement with the military over the past ten years,” she concurs. In the meantime however, this year’s 35th event is gearing up to be a big one. Running the gamut from slick pop-country to Americana to blues (which has become a staple of the past few years), it’s yet another Muster party waiting to happen, an event which has carved out its own little niche, how special it is the reason it’s still going strong, three and a half decades on from its inception.